The Guyana Gold and Diamond Miners’ Association (GGDMA) has launched a countrywide outreach programme as part of its push for higher gold declarations and to increase awareness about malaria in mining districts. The initiative follows last year’s almost record high gold production and the GGDMA’s stated intention to surpass the 12-year-old target set during the operation of Omai Gold Mines. 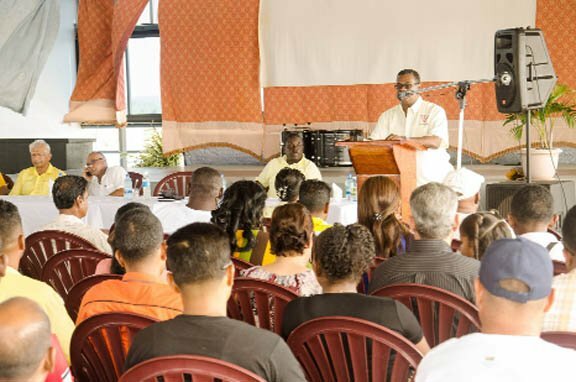 The first outreach meeting was held at Charity, Essequibo Coast,where the GGDMA said Association President Patrick Harding told a large gathering of miners and other stakeholders that a “figure specific” target has not been set since they are expected to surpass all expectations. 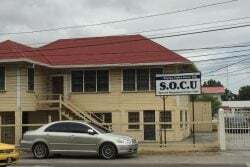 Harding also urged members to sell their gold to the Guyana Gold Board and licensed dealers. According to a GGDMA press release, the other objectives of the meeting were to inform miners about developments in the industry, including the rise of malaria in mining districts; the need for increased security in interior locations; and the reduction of international supplies of mercury and the subsequent need to explore new alternative recovery mechanisms. GGDMA President Patrick Harding addressing the first outreach meeting the Association held this year. Regarding malaria, the GGDMA noted that it has met with the Ministry of Health several times to lobby for increased action and to request more work to help control the disease but many times “they only get some nets and a lot of promises.” However, this year, the group will demand that the ministry do more for the industry or it will inform the international agencies which fund the malaria programme in order to prompt it into action. The Ministry of Health has noted that rising gold prices have created a population explosion in mining districts, where malaria is prevalent and it will make treatment and sensitisation priorities this year. The ministry recently reported that over the past four years, the number of persons engaged in the gold mining sector in the affected malarious endemic areas – especially regions 1, 7, 8 and 9 – has significantly increased from 20,000 to about 130,000. Meanwhile, on the issue of security, the GGMDA president said the Association welcomed the proposed changes in the police ‘F’ Division and it will fight for it to be given a bigger budgetary allocation to better serve interior locations. The meeting also discussed using alternative methods for gold recovery, since a reduced supply of mercury is expected due to international restrictions on its sale. “Mercury has been recognised to be the best methods for the recovery of alluvial gold in countries like Guyana and while the Association recognises the need to look for alternatives, these have to be viable and efficient,” Harding was quoted as saying. As a result, the GGDMA has been working with the Ministry of Natural Resources and the Environment for the continued use of the chemical until a viable alternative can be found. Harding also urged the miners to employ best practices while conducting their work and to take careful note of the Association’s motto, “Mining with the Environment in mind.” In keeping with this, miners were urged to ensure that they refill mined-out areas; adhere to health and safety guidelines for workers and follow regulations established by the Guyana Geology and Mines Commission. Harding and other GDGMA executives also urged miners to join the Association to benefit from access to free advice on starting up and operations, tried and proven techniques, networking and national and international representation. Stakeholders also posed a number of questions and the meeting addressed issues about land allocation, the need for improved interior infrastructure such as roads, the influx of foreign miners and the benefits of selling gold to the Gold Board and licensed dealers. The GGMDA said it plans to augment these achievements by extending training workshops, demonstration of techniques and technology; continuing advocacy for greater rights; and continuing to be a strong, credible and united voice for the industry.